Cats will be cats. Humans… will be clueless. Farfel and Bob are feline best friends and neighbors. When Bob learns that his human, Marcia, will be going away one night a week over the summer, leaving Bob stuck inside, Farfel wants nothing more than to reach out. Bob is touched by the dead mice Farfel leaves on the doorstep. The humans have a different reaction. Soon, Bob develops a reputation as a supernatural escape artist and Marcia and her fellow humans search for answers. Can Bob balance the needs of his loving human and his faithful, mouse-murdering best friend? 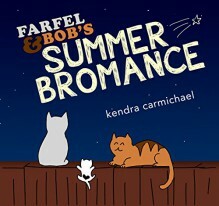 Farfel and Bob’s Summer Bromance is a lighthearted hybrid of text and comic slides for adults. If you like hilarious animals, tales of friendship, and peeks into the minds of cats, then you’ll love the first book in Kendra Carmichael’s Farfel and Bob series. BROMANCE CATS SERIES:- Farfel and Bob's Summer Bromance- Farfel and Bob's Super Stressful Weekend- Farfel and Bob's Cats vs. the Internet (coming 2017)Buy the first book to experience the cat bromance today!